Last fall I saved tomato seed. This was not about my carbon footprint. It was just something to try, another life experience. And why not Sun Gold tomatoes, those portable flavor bombs that produce for weeks — months — in the garden? So there I was in my kitchen, fermenting, decanting, drying the fuzzy little things. Come spring, the seeds sprouted into beefy seedlings. Anybody can do this, I thought. I was so proud I gave plants to friends, neighbors, a colleague at work. A fellow pea patcher planted two in the kids’ garden. Everybody exclaimed over them. “They’re so healthy!” they said. The plant I kept has outpaced them all, a novel situation for someone who’s usually a day late and a dollar short. It’s because the seed is so local, so acclimatized, I decided. Mid-July, despite of months of cool and rain, and the plant’s limbs are frothing over the top of their wire cage. Yesterday I caught a glimpse of the first green fruits. On second look, they didn’t seem quite right. Not like Sun Golds of yore, at least. And well. 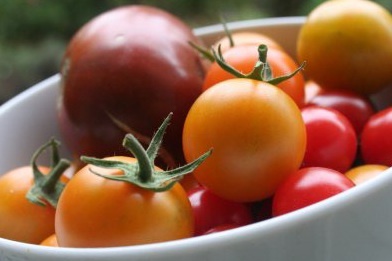 Here’s why: Sun Golds are hybrid tomatoes. Which means the tomatoes themselves don’t produce true seed. Second generation F1 hybrids, which these are, tend towards a random smattering of yellow, red, and orange cherries — of uncertain taste and character, I hardly need mention. So this life experience now involves calling seedling recipients to say, “Just letting you know about your mutt tomatoes!” And the kicker is I actually bought fresh Sun Gold seed this year. Just in case things didn’t work out with my little experiment. Never even opened the package. Here in the cool Northwest we’re still snapping snow peas from vines and pulling up the last overwintered fava beans. The Biscuit couldn’t be happier. She overgrazed the peas until a rationing program was put in place. She devours the favas warm and just skinned, can’t wait for a drizzle of olive oil or crunchy salt. She sits on the back porch and tears open the big spongy pods, samples the beans raw, says, “I want to eat them now — now — now!” Patience, grasshopper. Because getting to those delicate, ethereally green favas is a process. There’s the shelling, the brief swim in boiling water, the fingers fumbling with pale, tough, hot skins. It’s meditative, yes. 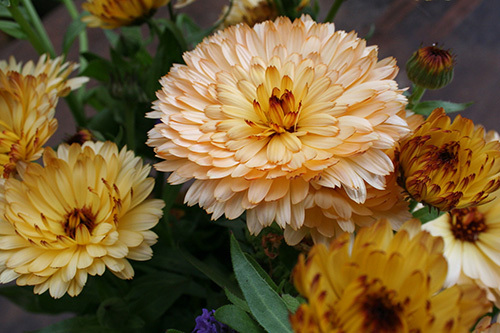 But you also feel it in your legs, planted for long minutes beside the kitchen table. Along the way, a generous pile of pods turns much smaller pile of beans. You worry there won’t be enough to feed your people. 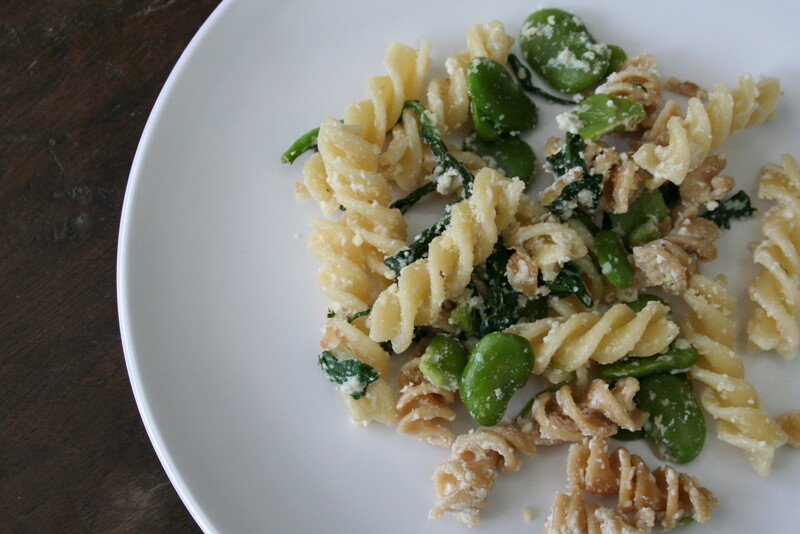 But it gets done and then dinner practically cooks itself: pasta tossed with ricotta, parm, a handful of beans. This iteration incorporates wilted arugula, because ours was bolting. You can use spinach instead, or skip greens altogether. 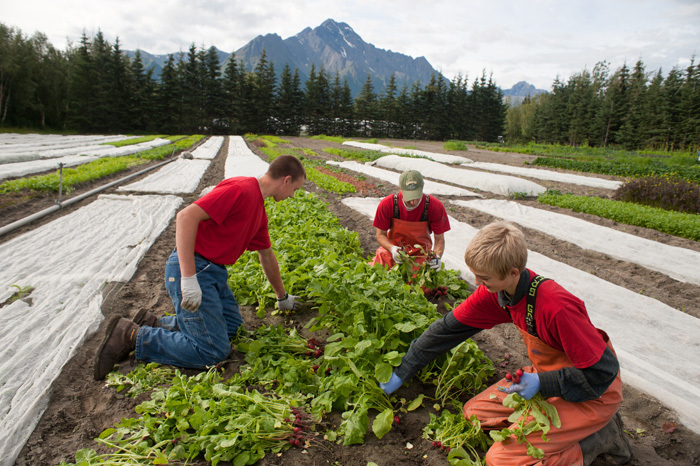 We found that cooked arugula delivers the mild, pleasing taste of spinach without the oxalic acid. Spring through and through, no matter that it’s June. Remove fava beans from their pods, drop the beans in boiling salted water, then slip off skins while still hot. Toss the beans with olive oil and salt to taste. Rinse the arugula or spinach. Leave some water clinging to the leaves and chop leaves coarsely. Cook the pasta until al dente, then drain. Meantime warm 1 tablespoon olive oil in a saute pan. Add minced garlic and saute for 30 seconds over medium heat, until just fragrant. Add arugula or spinach and saute until wilted, about 3 minutes. Stir in walnuts, ricotta, Parmesan, and favas. Toss with pasta. Salt and pepper to taste. Feeds 2-plus. The most homegrown thing on the table this Thanksgiving was pie, and though it was lovely, I’m not sure I want to have that life experience again. The main trouble was that the pumpkins were just awful in the garden this summer. Maybe it’s that we’re city folk at the 48th parallel, with postage-stamp backyards and 24/7 shade. But they hogged all the warmth and sunlight, blocked access to the back steps and killed about half the grass, leaving behind a cold season mud pit. 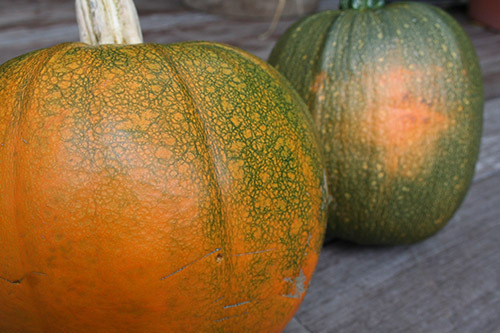 Much coddling was required to produce just three little sugar pumpkins, and even then powdery mildew brought down the vines in late September, the fruits dark green and speckled, not a blush of orange in evidence. A blasting indoor radiator turned the eldest of them orange by Halloween. The Biscuit notched this as a major victory. 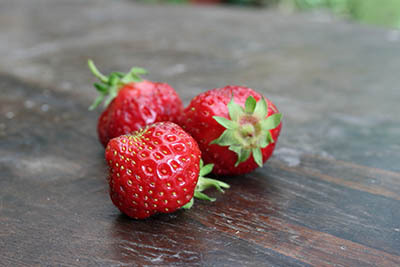 The two remaining ones continued their ripening at a glacial pace. We finally roasted them yesterday morning, and I wish I could tell you it was an epiphany. For sure, we had fun running our fingers through pumpkin guts. We counted seeds until we got to twenty and lost interest. 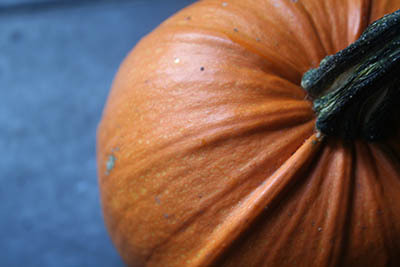 But truth be told, roasting and pureeing pumpkins was just one more thing to do on a long Thanksgiving prep list. It’s hard to want to go through all that again. The story starts with a fistful of cavolo nero leaves. Time was tight. There was no game plan to speak of, and cheesy ziti bubbled and browned in the oven. But who was ready to embrace winter — by which I mean stewed kale on the side? Not here. The snappy decision was raw kale salad. We’d declined to try it a few years back, when it was all the rage. And well! I’m late to this party, but let me tell you this stuff is actually delicious. I love the salad’s slight crunch and green freshness; the lemon juice softens the kale ribbons just enough to blunt its raw edge. Should you require further proof of concept, consider that my husband, a skeptic through and through, packed the remnants for lunch today. Strip stems from kale and slice into ½-inch ribbons. 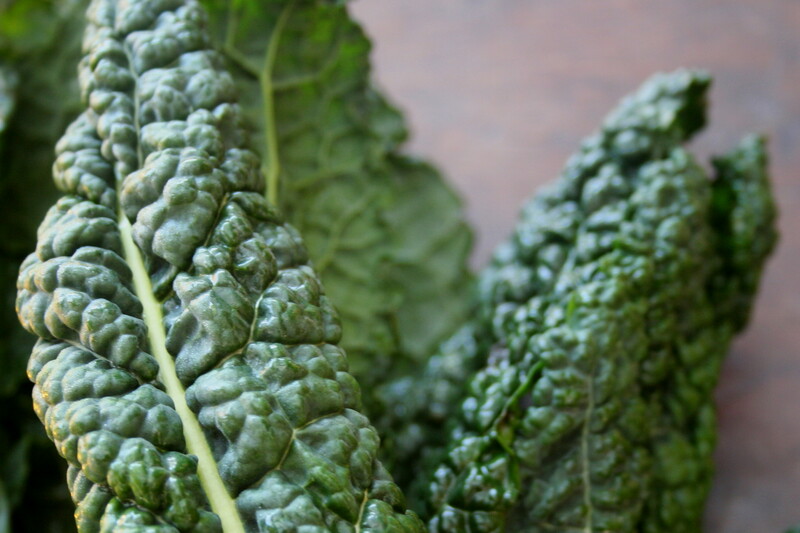 Mix together lemon juice, oil, garlic, cheese, salt, and red pepper, then toss thoroughly with kale until all strands are dressed. Toss again with breadcrumbs and let sit for 5 minutes before serving. Feeds 4 as a side. Adapted from Melissa Clark.